1 Brush zucchini and red pepper with 1 tablespoon Hellmann's® or Best Foods® Mayonnaise Dressing with Olive Oil and grill until tender. Remove to cutting board and cut into bite-size pieces; set aside. 2 Brush one side of tortillas with 2 tablespoons of the remaining Mayonnaise Dressing. 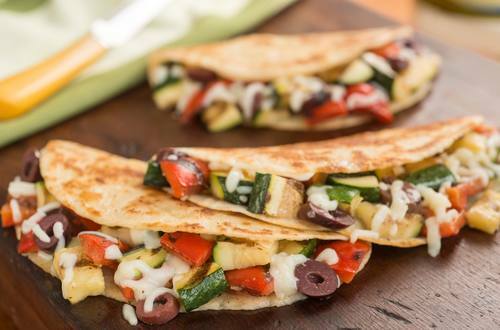 Arrange grilled vegetables evenly over half of each tortilla. Sprinkle vegetables evenly with cheese and olives. Fold tortillas in half over filling . 3 Brush outside of tortillas evenly with remaining 2 tablespoons Mayonaise Dressing. Grill turning once, until golden and cheese is melted, about 2 minutes. Cut each quesadilla into 2 wedges. TIP: These can also be made indoors on a grill pan.